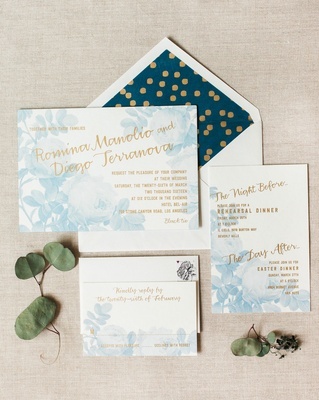 When asked if there was anything particularly surprising or unexpected about the task of wedding planning, Romina Manolio’s answer was a simple, resounding “no.” Perhaps that is in part due to her experience in the wedding industry as the senior designer for Revelry Event Designers – a premier event design and décor company in Los Angeles. 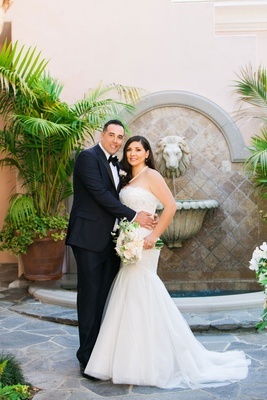 Though she has helped execute countless events for other couples, planning the details for her own wedding to Diego Terranova was an experience she’ll never forget. 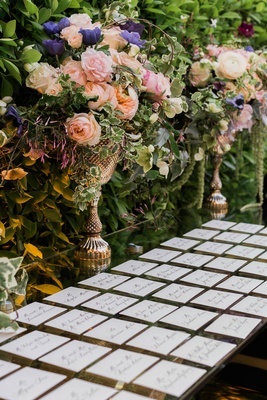 Knowing the color scheme she desired – pale pink, cream, and green with touches of wood – as well as her aspiration for the ceremony to feel romantic, elegant, and enchanted, she entrusted most of the decisions with her floral designer. 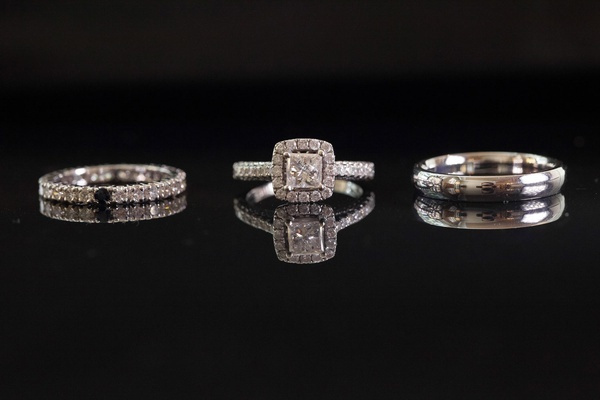 “I knew he was going to amaze me,” shares the bride. 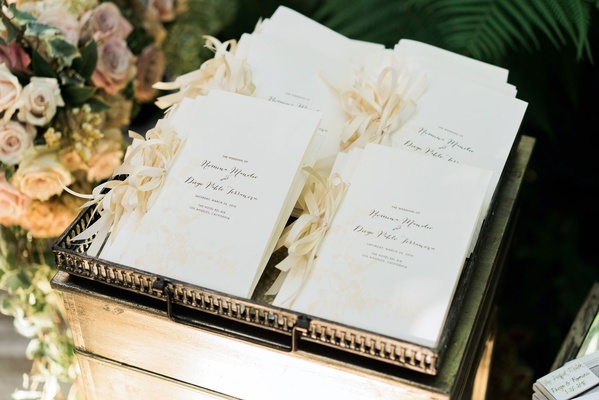 On the day of the alfresco nuptials, over 100 loved ones gathered on the lawn of a luxury resort to witness the vow exchange. 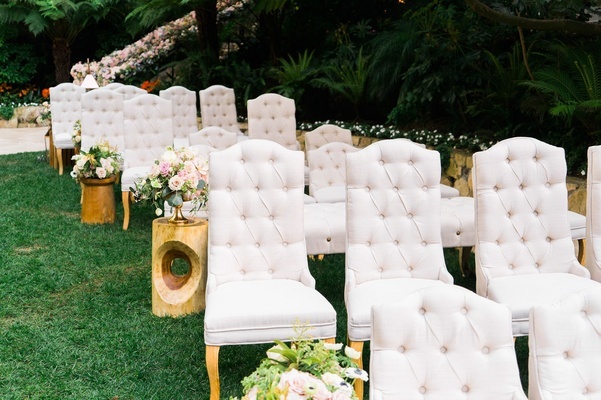 Guests found their seats atop various tufted upholstered chairs and benches in light grey with wooden legs. 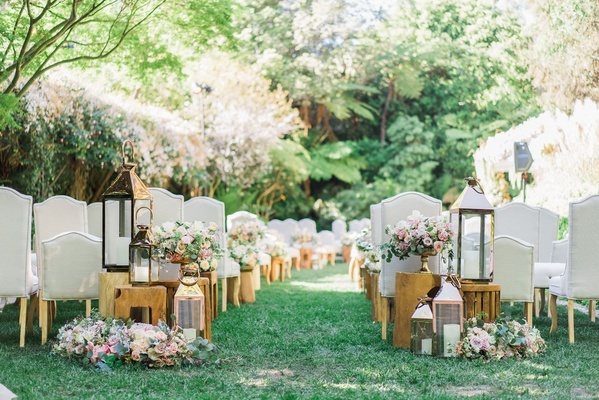 The entrance to the setting was flanked by metallic lanterns and natural wood side tables topped with footed gilt vessels filled with rosy blooms and ample greenery – a design element that also lined the aisle. 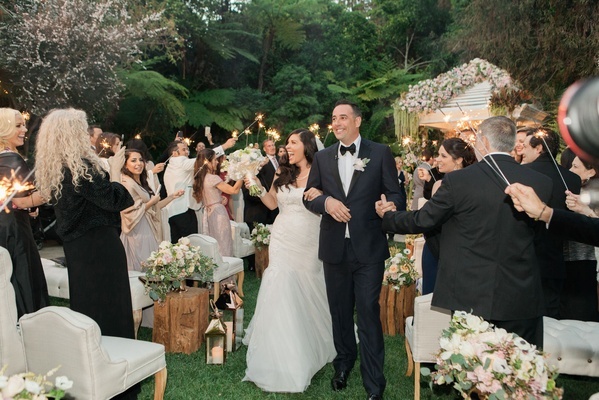 In order to represent the couple and their friends, acoustic versions of some of Romina and Diego’s favorite songs were performed by a solo guitarist throughout the ceremony. “The music was flawless,” remembers Romina. 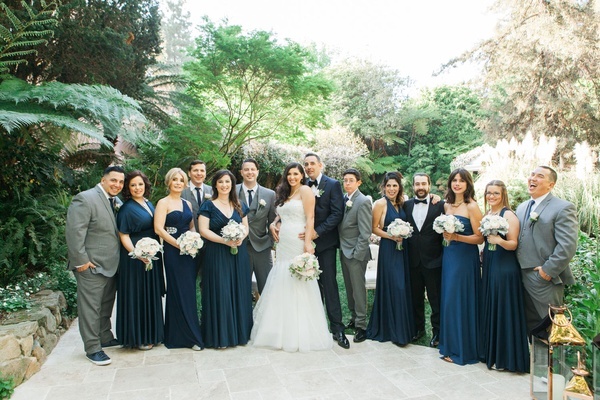 The groom walked down the aisle to “Is This Love” by Bob Marley, while bridesmaids dressed in mismatched navy blue floor-length dresses and groomsmen attired in grey three-piece suits descended the aisle to “I Want to Hold Your Hand” by The Beatles. 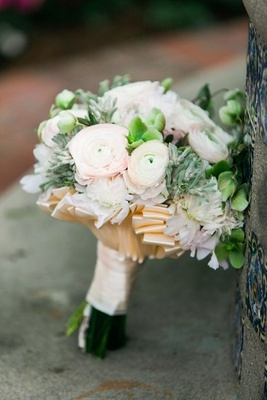 At last, the bride made her entrance dressed in a lace trumpet gown to the melody of “Love Song” by The Cure. 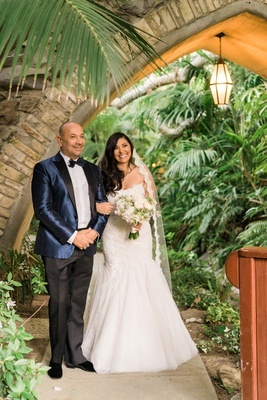 Once she and Diego exchanged their vows beneath a lavish arch decorated with roses, amaranthus, greenery, and branches, guests waved sparklers as “All You Need Is Love” by The Beatles filled the air and the newlyweds walked up the aisle hand in hand. 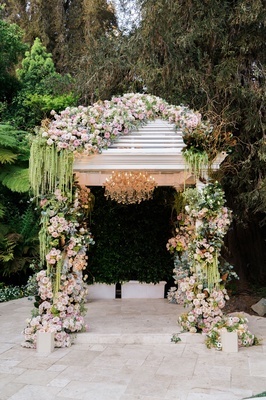 Following the ceremony, guests traversed the grounds through a floral arch of garden roses before entering a dramatic cocktail hour space draped with pale rose gauze and illuminated with clear glass pendants suspended overhead. 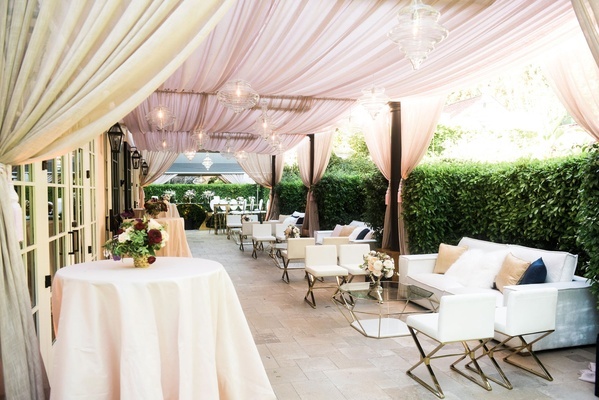 Comfortable seating areas showcased luxury lounge furniture from Revelry Event Designers, including plush white sofas decorated with blush, white fur, and navy throw pillows. 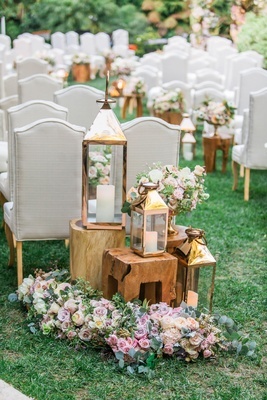 Alabaster side chairs with gold bases were placed around geometric glass coffee tables featuring gilt elements and topped with compilations of blooms that effortlessly blended with the style of the ceremony space. 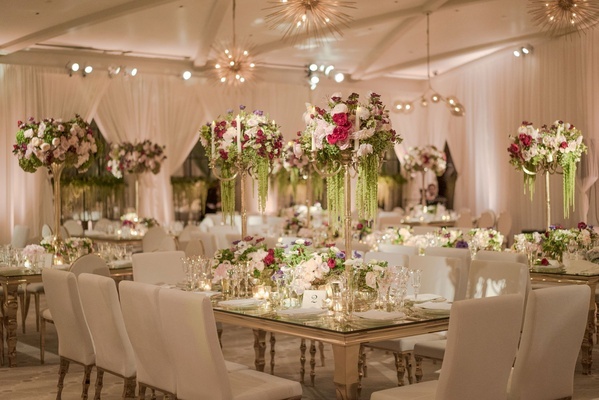 Loved ones soon entered a ballroom for the sit-down dinner service. Luxe drapery covered the walls, and unique lighting pieces with mid-century modern designs gave the area a residential feel. 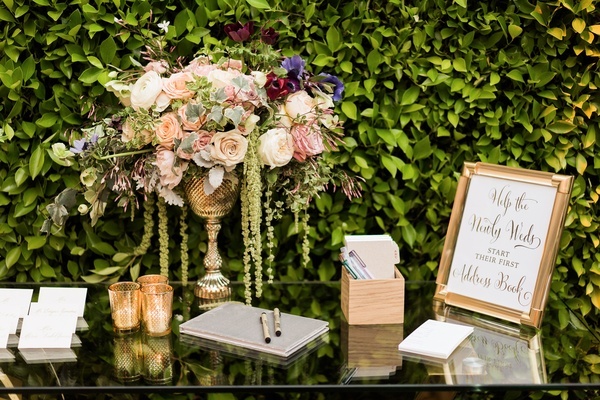 The color palette incorporated during the vow exchange was carried over into the reception, as gold, pale rose, ivory, and cream elements adorned the space, with the addition of burgundy and green tones, which were primarily seen in the florals. 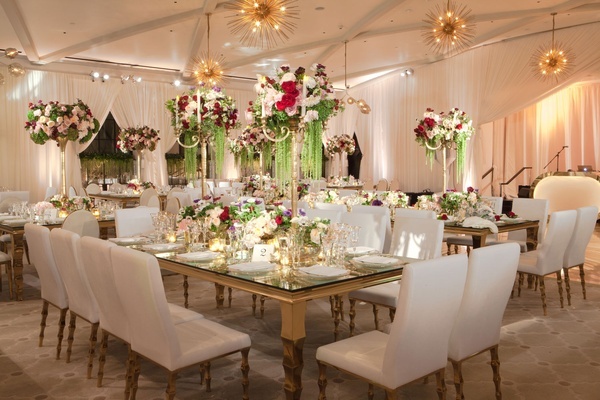 Mirror-top gold tables were surrounded by either square- or round-back chairs with bullion bases; flickering candlelight emitted from mercury-glass votives illuminated the tablescapes. 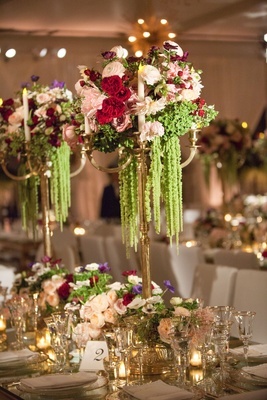 A combination of high and low centerpieces showcased garden roses, peonies, anemones, tulips, and ranunculus blooms, as well as amaranthus – one of the bride’s favorite floral varieties – in short mercury-glass vases or atop towering gilt candelabra. 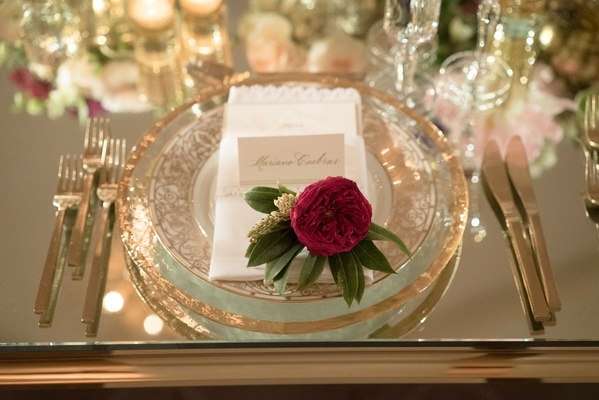 Each place setting was also decorated with a single marsala blossom. 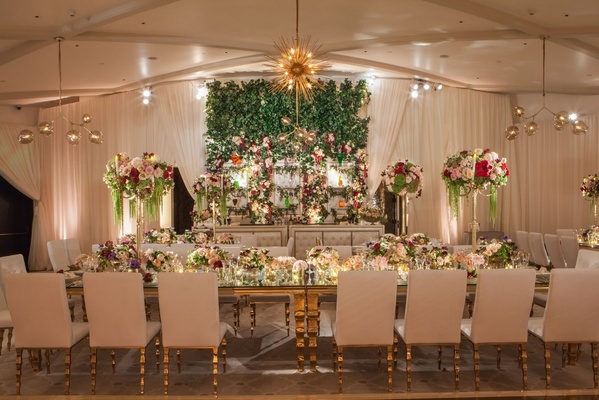 “The flowers were just amazing,” shares Romina. 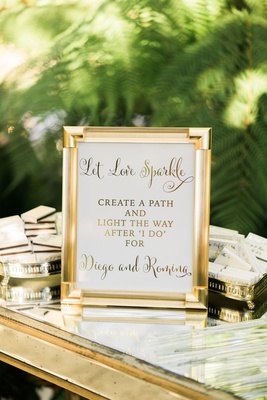 Since the newlyweds wanted to spend as much time as possible dancing with attendees, “music was key,” notes Diego. 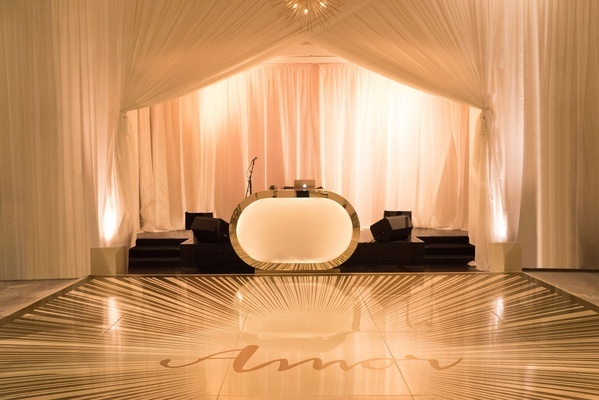 In fact, a DJ kept revelers celebrating on the custom dance floor, which featured a sunburst motif and the word “Amor,” until 4AM. 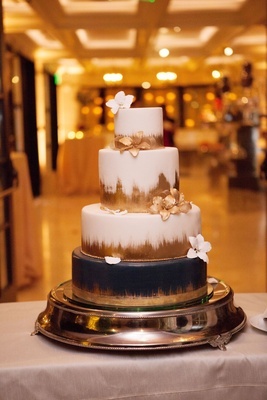 To keep guests energized throughout the night and into the early hours of the morning, slices from a four-layered wedding cake showcasing gold brushstroke details and gilt sugar flowers were served, as well as the main confection: a Uruguayan dessert called chajá, which features delicious dulce de leche and merengue components.